Christmas dinner can be difficult for vegans. Many traditional dishes are topped to the brim with eggs, cheese and milk not to mention chicken or ham. Dinner can quickly become a plate with a bun (if you’re lucky) and some green beans if you aren’t prepared. This is why it is essential to plan a great meal that will have any meat eater ditching the turkey stuffing for a delectable vegan alternative. The amazing Katherine Kooks created a fantastic recipe for Red and Green Christmas Tarts and posted it on her blog, My accidentally delicious vegan cuisine! These tarts are delicious and a great choice for a potluck because of their holiday appropriate colour palette. They are easy to make and, surprisingly, taste similar to stuffing. By combining cranberries, broccoli, Portobello mushrooms and sundried tomatoes with spices, almond milk and tahini, it creates a colorful and healthy food mixture. The combination can then be placed into mini pie shells and baked for 25 minutes. This recipe is easy, quick and healthy with a holiday twist. It is a great food option and will bring festive vegan cheer to the dinner table this Christmas holiday. pie shells * Our compliments makes vegan pie and tart shells! Heat pie shells for seven minutes and they will expand slightly. While shells are heating, sauté minced garlic and Portobello mushrooms with coconut oil. Add a pinch of rosemary, basil and sea salt. Chop broccoli florets and saute with sundried tomatoes. Grab that bowl with mushrooms in it! Toss in 1 1/2 cups of almond milk, 2 tbl spoons of tahini. Chop in green onions, black pepper and a dash more rosemary. Stir the mixture and add in the broccoli/sundried mix. It will almost solidify in the oven. As for the cranberries, take the partially toasted shells and drop it in the bottom of each tart. Spoon the mixture on top and added one more cranberry to the tops of each tart. Bake them for about 25 minutes., just keep an eye on them if the tops feel too soft they need more time. For more delicious vegan recipes, visit Katherine Kooks food blog and enjoy! Kids — and let’s be honest, a few adults to — look forward to December 1st. Not only is it finally socially acceptable to play Christmas music in public, but it’s also the first day of the “Christmas countdown.” I’m talking about the advent calendar. The clothespin advent calendar: This is an absolutely adorable way to count down the days to Christmas. Attach a small wrapped bag to a clothespin and let it hang using ribbon or colourful string. 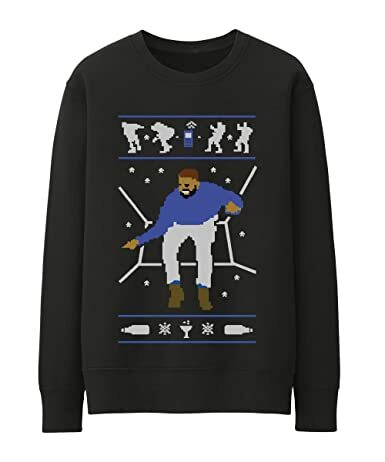 Not only is it visually appealing as a Christmas decoration, it’s also quite functional. The surprise-in-a-box advent calendar: For those who don’t want to have 24 small bags lining their wall, this is another option. Wrap a few special prizes in paper and put it in a decorative box. Each day, your child can open the box and dig for their daily surprise. The decorative advent calendar: It’s not always about the gifts. In this advent calendar, each day reveals a tree ornament that the family can then place on the tree. This particular one is made of felt, but it can be done using any material on hand. The toilet roll advent calendar: Why waste some perfectly reusable toilet rolls? All you need for this DIY project is a glue gun and some extra cardboard for the roof. If you want to make this more interactive, make a box to slide the toilet rolls into, and then hang it up. You can even fill the toilet roll with a little surprise or note for your kids, and they can pull it out each day. The card-stock advent calendar: Not every advent calendar has to be big and loud. This version is simple, understated, and beautiful. Write some specialized messages for your family and put them in a sleek envelope. The towering advent calendar: This one is not for the faint of heart—expert crafters are required. This involves making small, but highly decorated, cardboard boxes and placing them strategically in a tree shape. I think it is absolutely gorgeous; but I’m not sure if I have the skills or patience to put it together. The mason jar advent calendar: This one is more my craft-level. It’s brilliant in its simplicity. Wrap a few candies, stickers, and notes. Give them each a number. Stuff them all into a decorated mason jar. Done! The good-things-come-in-small-packages advent calendar: This advent calendar is all about the decoration. Wrap 24 items in equal size boxes or bags, and then stick them onto a board using double sided tape. Make sure the treats aren’t heavy. The ornament advent calendar: Do you have a small plant just sitting in the corner of your living room? Turn it into an advent tree by attaching small numbered bags to the branches or stems. The “for the adults” advent calendar: This one is a party! Wrap 24 small bottles of alcohol in Christmas colours, making sure to label them clearly so there isn’t any confusion. Remember, you can only have one a day! Note: If partaking in number 10, remember to advent responsibly! Poinsettias, wreaths, and ornaments found their way into malls and stores way back in early September. It seemed a bit early to be celebrating the holidays, especially considering it doesn’t start to feel like Christmas until November. The days get shorter, the air gets chillier, and the sweaters just get cozier. It’s the perfect time to blast some Christmas carols and put up the tree. However, instead of the usual green tree, red ornaments gig, try something new this year! We’ve compiled a list of unique yet totally doable Christmas tree decorations that will get you so excited for the holidays—you’ll want to start now. Who said coral blue was just for the beach? Add a pop of summer to your winter by going with a silver and blue colour scheme. Great for large living rooms with white walls and cream decor, this Christmas tree will have your place looking minty fresh. Besides, opting for an artificial tree will help you avoid the sadness that you’re overcome with when your tree is in its last stages of life. Christmas is all about the sweet stuff, isn’t it? Gingerbread cookies, fruit cake, and all that sugar and icing is just as fun to eat as it is to make. 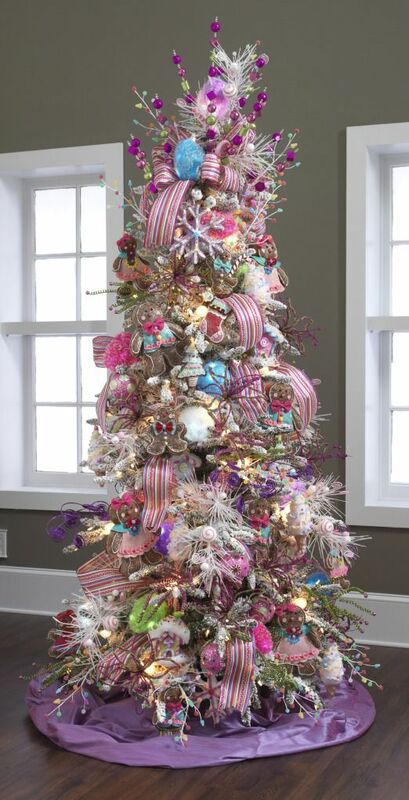 Take the fun out of your kitchen and into the living room with this funky candy-inspired tree. The pops of colour and the quirky tidbits will make your place the hot spot during the holidays. The best part? Your tree could possibly be edible. 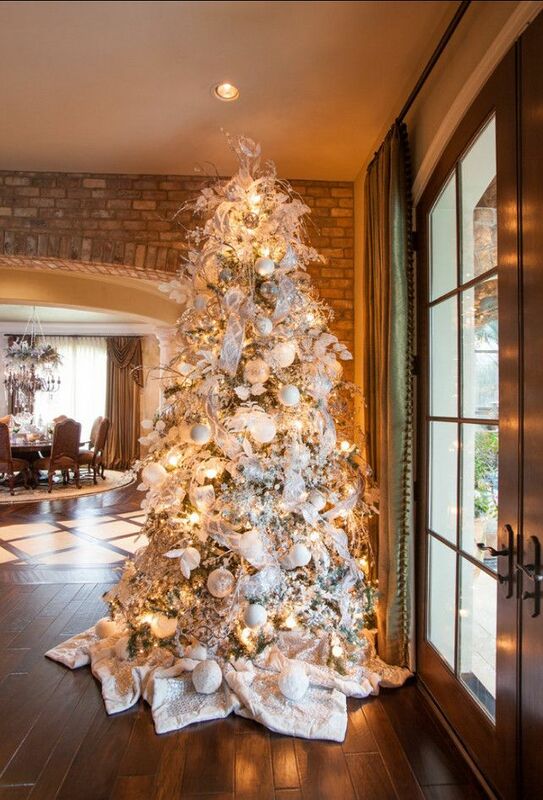 If Olivia Pope had a Christmas tree, it would be this one. This elegant look will make your window the brightest one in the neighbourhood. Not only does it look grand, it’s super easy to pull off. With only one colour to deal with, you can’t go wrong. It’s certainly a great idea for your loft or home and will match living rooms of any colour scheme. 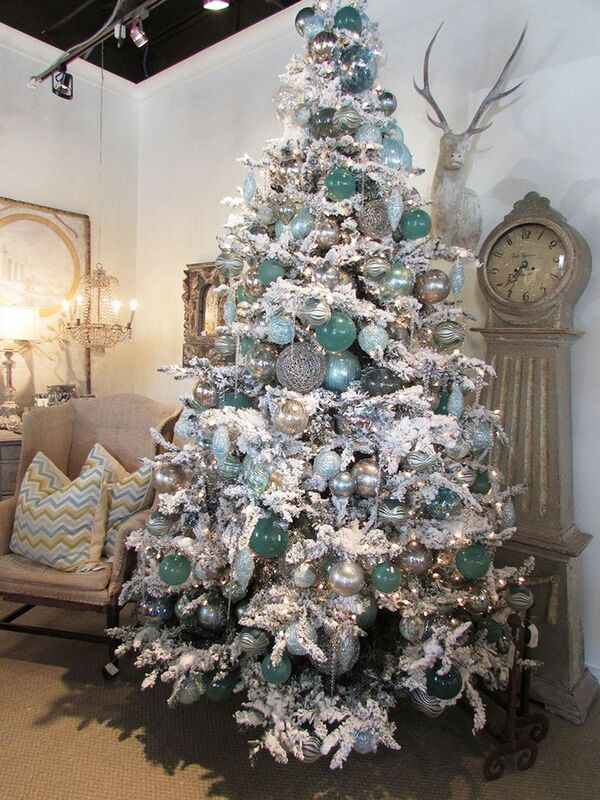 If you’re prone to spillage and are concerned about bringing in white furniture, indulge with this tree! Pop open that red wine bottle and take in your masterpiece. You can never go wrong with a standard, green Christmas tree. It reminds us of our childhood, creates a sense of familiarity — and grandma will always approve. However, this year, spruce up the tree by deciding on one specific colour. The key to a classic, yet modern, look is contrast, as shown above with the gold accents. Make your ornaments pop in midst of the greenery by choosing the appropriate colour. The world is your oyster. It’s easy to forget the true meaning of Christmas in midst of all the shopping, sales, and new Apple gadgets in stores these days. This tree is certainly a reminder that the holidays itself are a gift. It’s a time to celebrate with family and friends and rejoice the fact that everyone is together. 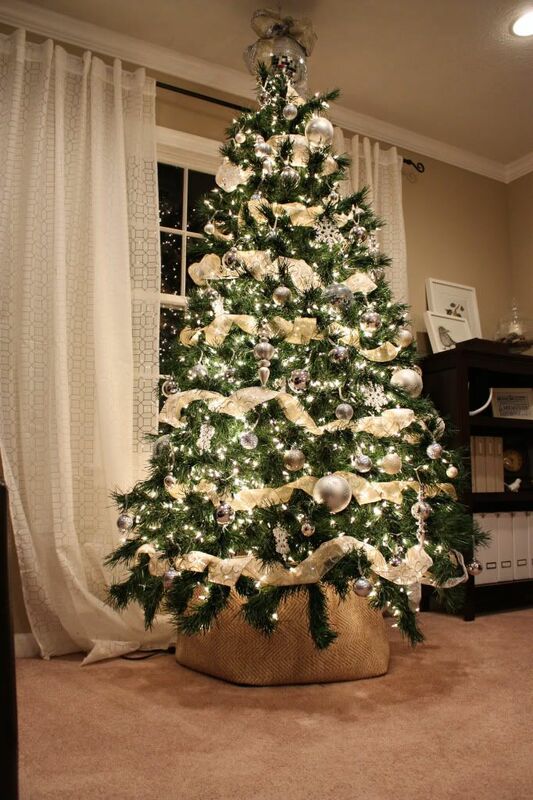 Use a bright coloured ribbon to wrap your Christmas tree and tie a decorative, grand bow at the top. The tree itself will be a gift – to the eyes and the heart. Besides, you can never complain about having too many presents!